Viet Nam is a country rich in handicraft products, thanks to the hard-working, dexterous, and creative qualities of the Vietnamese people. For a very long time, handicraft products have been a source of cultural pride and a source of income for the people. As the varieties of handicraft products are too numerous to be fully introduced, only a few typical items and their sources are mentioned here. Woven tapestries and brocade handbags are unique works from the skilled hands of the ethnic women living in the Northwest regions, such as Cao Bang, Lao Cai. Embroidered articles and silk products are famous from the regions of Van Phuc (Ha Tay), Nam Ha, Thai Binh, Hue, Dalat (Lam Dong). Wool tapestries from Ha Noi and Hai Phong, and jute tapestries from Hung Yen, Hai Phong, Ha Noi and Thai Binh, are much sought after. Ceramic and porcelain items have been produced in Viet Nam for a long time. 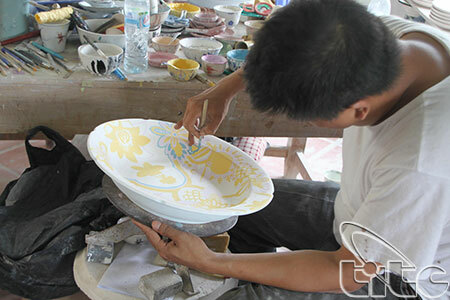 Ceramic and porcelain products glazed by traditional methods into beautiful art are well known in Bat Trang (Ha Noi), Dong Trieu, Thanh Ha (Quang Ninh), and Hai Phong. Copperware is fabricated by the skillful hands of coppersmiths in Ngu Xa (Ha Noi), Dai Bai (Bac Ninh), Dong Son (Thanh Hoa). Jewelry products and metalwork are concentrated in Ha Poi, Thai Binh and Hung Yen, while stonework are mainly produced in Da Nang (Five Element Mountain Region). Wood products and wood carvings can usually be found in Phu Xuyen (Ha Tay), Dong Ky (Bac Ninh), Hai Phong, and Hue. There are thousands of types of handicraft products. Some of these handicrafts have been internationally recognized and popularized, such as lacquerware. 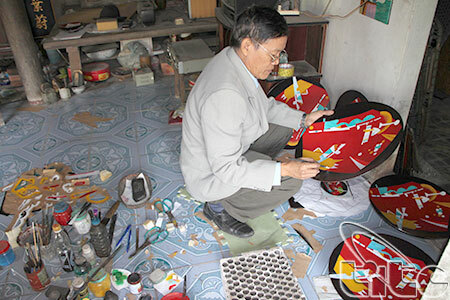 While lacquer artists produce a limited number of paintings and sculptures, lacquer crafts have been part of Vietnamese life in many forms: vases, boxes, interior decorating items, jewelry, and office products. With about 2,000 years of history, Vietnamese products made by a community of handicraft artists, have established a firm and growing position in the domestic and international markets.